Though not officially sanctioned nor endorsed by Pixar, the below are two concept renditions of the animated characters. This dude named Panzervargas is quite the 3D scale model artist and imagined what Woody and Buzz would look like in a more ‘adult’ oriented context. The result is pretty startling. Buzz definitely has Terran space marine grit to complement his chiseled armored figure while Woody is a classic right out of a Zane Grey paperback. Dubbed ‘Toy Story Unleashed’, a bit of creative collaboration has been brewing between the Panervargas dude and some comics illustrator/hobbyist at Deviantart. 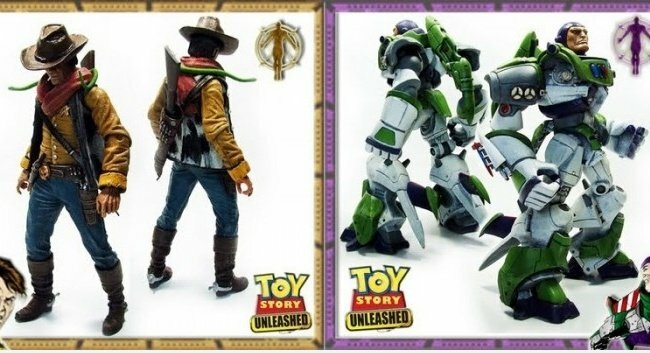 The storyline (or possible storyline) for this Unleashed spin off is Buzz travels to the American West to battle aliens so he joins forces with Woody and his cowgirl sidekick. Corny stuff, but if Aliens vs. Predator were possible (much less Cowboys and Aliens), why not this? Panzervargas has a nice blog going that’s a portal to his scale model work and the stuff he’s posted up are quite impressive. Like all passionate scale modelers, the detail is what really adds a special luster to his creations.